This pattern is a 9 page PDF file (1.37MB) which is available for instant download once your order is completed and payment submitted. You will be sent an email with the download link. Additionally, you can log in at a later date and download again if you wish. This pattern makes a darling baby quilt featuring Real Tree Camo fabric as the center block. The finished quilt measures 36" x 48". 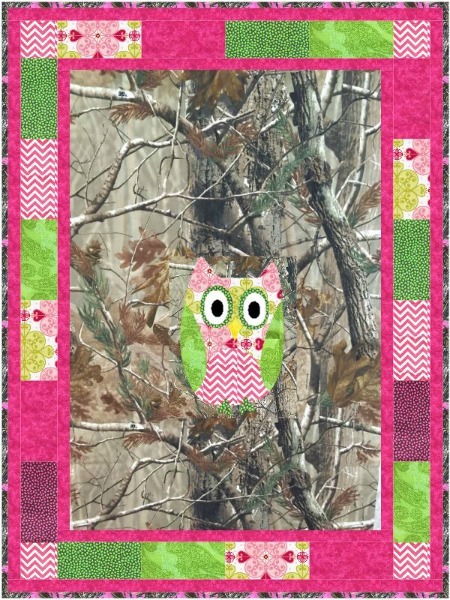 The pattern contains a fabric yardage chart as well as the templates for the owls, birds, leaves, and tree applique. While the fabrics shown are for a baby girl, just change your colors and it will be easily suited to a baby boy. We rate this pattern as a Confident Beginner and believe you will find it easy to put together. If you have any questions at all, please feel free to contact us.